I love the idea of Minecraft, but I lack the time, patience and attention span to get anywhere in it. What I need is Minecraft with a strong guiding hand. That’s Dragon Quest Builders in a nutshell. I’ve spent several hours wandering about Minecraft. I start projects and end them before the materials are gathered. I vow to create an impenetrable fortress in survival mode, only to find myself halfheartedly digging to the center of my world and dying over and over again. I enjoy the building and exploration, but without some instruction I quickly lose my way. 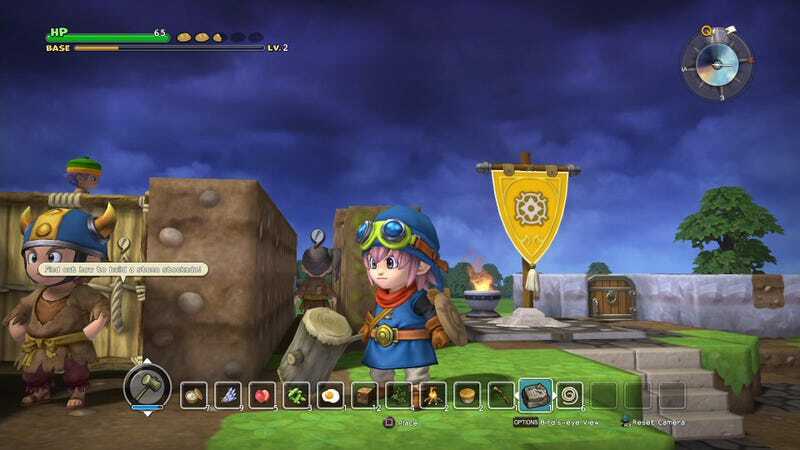 Dragon Quest Builders, released this week on PlayStation 4 and Vita from Square Enix, gives me the direction I crave. Playing as the only human with building skills in an alternate version of the original Dragon Quest game where the world was destroyed, I’m engaged in guided activities right from the start. First I learn the basics of building. Then I plant my flag in the center of a ruined town to attract other characters. Those characters begin giving me quests. Build a simple room with a couple of mattresses so we can sleep through the dangerous night. Now fetch us some food. Now build a kitchen so other characters can cook while I’m off exploring. It’s a lovely mixture of free-roaming and objective-based gameplay that makes the basic Minecraft formula work for a person like me. It’s not like Dragon Quest Builders is telling me exactly what to build and where. A basic room is an area fenced in with a two-block-high wall and a light source. I can make it as big or small as I want. I can use appropriate materials as I see fit. As long as the basic requirements are met and it isn’t one of the rare instances where a non-player character provides me with specific blueprints, I am free to build as I please. Exploration is more exciting and engrossing as well. Discovering new materials allows my character to instantly come up with new recipes—there’s no trial and error involved. That might turn off some players, but it works for me. Scattered across the world are NPCs who will either come join your settlement or offer you quests to learn new recipes, so aimless wandering is tempered with wandering of the aimful sort. I never get that lost-in-the-woods feeling that Minecraft often gives me, thanks to easy fast travel and an overland littered with half-completed structures just a few blocks away from being safe havens. Crafting stations also appear in the wild, so healing cream and other survival items are just a bit of harvesting away at all times. And really, combat isn’t that tough. All enemies have a basic attack pattern that’s easy to suss out, and dodging the enemies who don’t drop materials in favor of those that do is pretty simple. It really is a sort of Minecraft with training wheels. It just so happens that the bike those training wheels are attached to is painted with the delightful Dragon Quest style, with colorful characters, iconic creatures and a horn that plays variations on classic themes. My main problem with Dragon Quest Builders is stopping. Between the questing, exploration, city-building and gathering, it’s incredibly hard to stop. I don’t know how many times I’ve saved my game with the intention of doing other things only to find myself teleporting to the other side of the world to see about finding some copper and coal for whatever it is the people in my city wanted next. Minecraft will always be Minecraft, an amazing, open-ended creative and social experience centered around stacking blocks. For folks who prefer their ends a little more closed, there’s Dragon Quest Builders.